The annular solar eclipse was a pleasant surprise for me this morning on May 21, 2012! At 7:25 this morning my entire neighborhood was out and about in the streets and on their balconies wearing 3D glasses staring at the sky as I thought to myself "Did God decide to broadcast national 3D television in the sky today?" No really Japan, what is up with those 3D glasses? Ok, the sun was pretty bright once the eclipse appeared through the clouds and at that moment I heard oohs and aaahs from every house on my block. Yes, today was an exciting morning in Japan as it was the first solar eclipse that I have ever seen in my lifetime during the day, or at least from what I can remember! Because I have been so out of touch with the world, no tv and barely any time to surf the internet, I briefly remember someone mentioning the eclipse over the weekend, but I had completely forgotten in a matter of seconds thinking it was no big deal. Another shot of the solar eclipse at around 7:30am. Today's event served as a great warm up conversation in all of my classes. I started by listing the word solar eclipse on the vocabulary section of the board and asked my students "Did you see the solar eclipse this morning?" Some of my students knew the word immediately, while others didn't and I had them explain in English what solar eclipse meant. They came up with things such as "the sun and the moon meet together and there is a bright ring or circle." They did pretty well and immediately the other students understood. They were excited as one student said there is only a full solar eclipse ever 300 years. I found this hard to believe, but its true! Every 300-400 years there is a total solar eclipse. So technically it wasn't a solar eclipse, but an annular eclipse also known as a total eclipse is what happened today, when the moons shadow passes over the earth. So today was a special day and everyone was freaking out for a good reason! One of my students even busted out her special solar eclipse sun glasses and posed for me next to the white board! I told her, "I just wear my sunglasses!" and busted out mine! 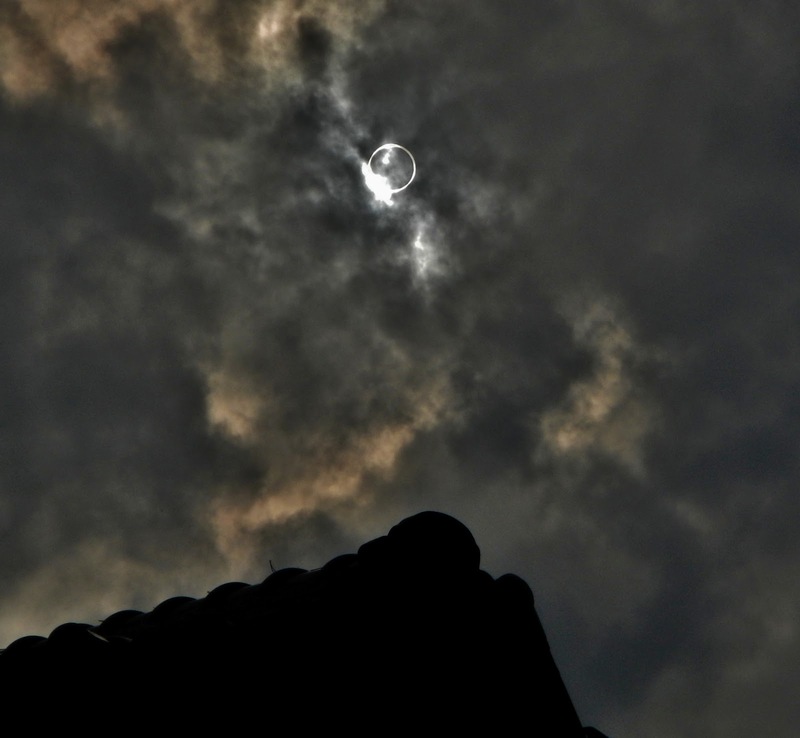 The annular solar eclipse of 2012 was an exciting moment to experience in Japan. Many of the students explained that seeing the eclipse is a sign of good fortune and a new beginning. They strongly believe in the natural world and made it clear that the eclipse was an exciting event. I am so happy I was able to witness this today on my walk to work and share the experience with my co workers and students! In addition to the eclipse, the walk home from work was absolutely beautiful with the sun setting in the background. Right now roses are in full bloom and my entire neighborhood is blossoming! The sun setting on the subway ride home from work. The small river right by my apartment as the sun sets today. A photos of some cool houses off my street. One of the nicest houses on my street. Another shot of my neighborhood with the sunset. My neighbors garden in bloom. My favorite rose in my neighbor's garden in Tokyo, Japan. Nice little 'hood. Tokyo looks so stark but clean compared to Seoul!